Most of you Spain loving readers will know that the name Spain is derived from the Roman “Hispania”.. Where this apparently non-latin name came from is subject to discussion but one theory is that it was derived from the Phoenician word “i-spn- ya” which means isle of rabbits. It is said rabbits plagued the Iberian peninsula in those pre-Roman times. The rabbit has and does play an important role in Spain.Ok,so when I say important I mean relatively important. I am not talking about rabbits changing the course of history or banding together to launch rockets into space but the fact that this humble fourlegged mammal has carved out a niche in Spanish gastronomy,culture, and plays a vital role in the food chain and not just for us humans is evident.The rabbit in the mists of time was revered by some civilisations as a symbol of fertility. Its ability to procreate rapidly impressed ancient civilisations. So where does the rabbit come into Spanish life? Well,take hunting,for example. The rabbit has been the staple diet for many millions of Spaniards for thousands of years. They were and still are a good source of protein. 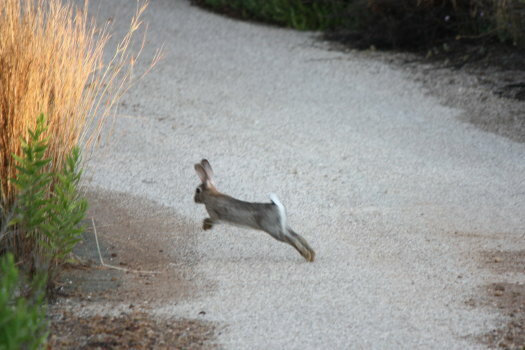 There are many ways of hunting a rabbit and in Spain it varies according to the region you are in. In Alicante,for instance,there is a custom of hunting rabbits in large bands of men with dogs and short fat sticks which they throw at the rabbit when it breaks cover.Then,in other areas with the shotgun,with dogs,with ferrets etc.In many areas of Spain they hunt with just dogs. Over the years the rabbit has had a hard time of it and in some areas it almost disappeared because of illness and overhunting.Now, however,it is possible to see it has made quite a comeback in some parts of the country but they are not as tame as they are in some parts of the UK. The hunting of rabbit is not exclusive to us humans. Raptors of different kinds feed on rabbits,bringing up their young on them every summer. 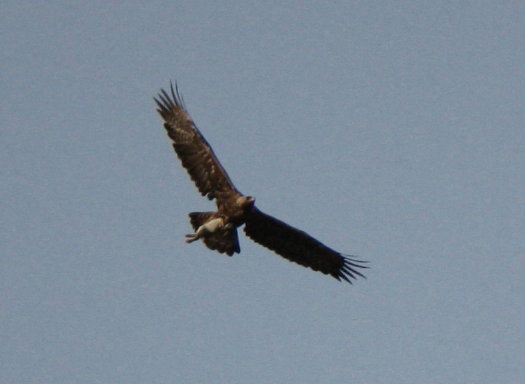 One of the ways to keep down plagues of rabbits is to ensure a healthy population of eagles. The famous Iberian Lynx, also,feeds on rabbits. So they are a vital link in the food chain,nowadays not so much for us humans,but for wildlife they are. Logically,then if the rabbit has been so prolific throughout Spain’s history it has had an influence on Spanish gastronomy. Some great rabbit dishes have evolved over the centuries. 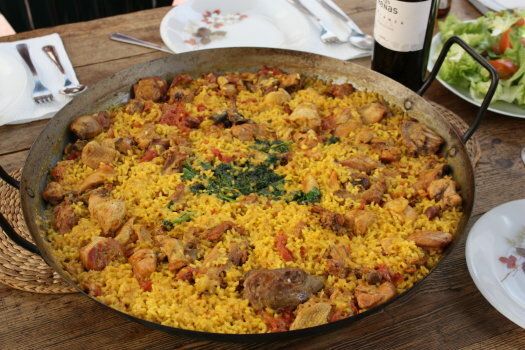 The first one that springs to mind,of course,is “paella valenciana” with its famous mix of rabbit,chicken and vegetables; an all time classic Valencian dish. 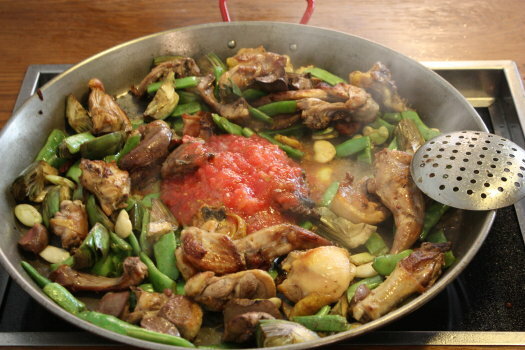 Then,there is “conejo al ajillo”,which is basically rabbit with garlic and is delicious cooked over an open fire. And not to be outdone is “arroz murciano” which is similar to paella but with a Murcian twist and is simply one of the best rices dishes in Spain. Then,for those that like a good hearty meal on a cold day after walking in the mountains there is a dish called “gazpachos” often called “gazpachos manchegos”. 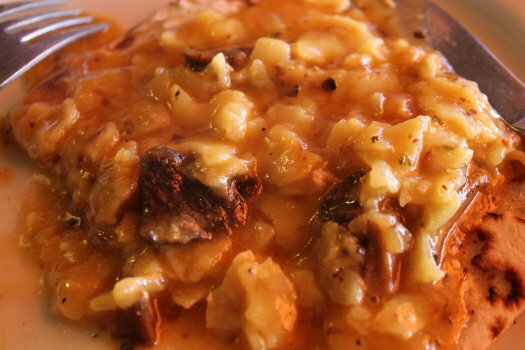 This dish is especially popular in the rural and mountainous areas between Albacete,Alicante and Valencia. Basically it is a stew made from game so has venison,wild boar,hare or rabbit. The stew also contains a pasta like ingredient which is actually dry unleavened bread or a cracker like biscuit that once cooked in the stew takes on a pasta like consistency. This dish is a ‘must try’ when visiting this region of Spain(inland Valencia). It is one of our favourite Spanish recipes.There are also other dishes like rabbit and snails with tomato sauce, which is not so well known but is a popular rural recipe in some areas. So,rabbit is still very much part of gastronomic life in Spain and I can vouch for that as when visiting my inlaws I often have to go with my mother-in-law to buy “the rabbit” for the “arroz murciano”. As she pays for the animal,a sack with a moving bundle inside is handed to me which always makes me feel a bit like an excecutioner’s assistant. The bag visibly moves as I put it in the boot of the car.Very different from loading up your normal supermarket shopping bags.Once home the condemned animal is despatched by the expert hands of my father-in-law and is ready to be prepared.It helps make the Murcian Rice(arroz muricano) a cracking dish. A spectacular taste. 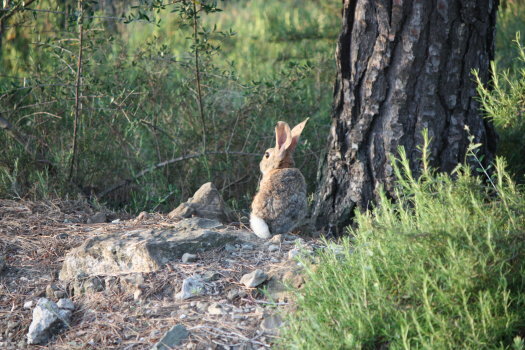 From my experiences over the years with Spanish friends and family it is clear that rabbit is still popular in Spain and even killed at home sometimes but in rural Spain it is part of everyday life and there are no qualms or problems about killing a rabbit when necessary. This is logical as the older generation in rural areas including my inlaws lived through post Civil War Spain and experienced real hunger and saw people suffer miserably. Thus,their common sense attitude to the matter. Moving on from practicalities of rural life, I would love to tell the story of Julia and my mother-in-law in the UK some 25 years ago trying to buy a live rabbit for the Sunday paella. It’s a classic but I think I will save it for another time. So if you fancy a bit of rabbit and get the chance when in Spain I can recommend any of the above dishes especially paella valenciana,gazpachos and arroz murciano.And remember man’s best friend in Spain over the centuries has probably been the rabbit. This entry was posted in Spain and tagged birds of prey, Culture, Food, Food and wine tours, gastronomy, mountains, nature, paella, Spanish Traditions, wildlife by Paddy Waller. Bookmark the permalink. Great post, Paddy! Cracking photos too! The one thing that I miss about rabbit (and other game) here in Spain is that is is not hung to give that rich flavour – but I do still love a bit of bunny from time to time! I’m a complete rabbit freak when it comes to food and after trying it a number of times up in the Pyrenean foothills, my next culinary endeavour is going to be Rabbit with Snails ….. mmmmmmmmmmmmm! Thanks for your comments Simon…….nice to hear you’re a rabbit freak! I wouldn’t eat rabbit for years (I had a couple of rabbits as indoor pets back in the UK), but my Mother said I loved it as a young child. So I tried it again about 3 years ago and I love it! It still causes a little tug at my heart strings when I see the fluffy loves in sacks at the market – but yeah… I know how good they taste! I have finally relented and agreed that Alan can have a gun again… as he can go hunting with the boys and bring home a Thumper or two for dinner. I love it most, chopped into bite sized chunks and cooked in a deep pan with plenty of garlic and onions. Best eaten with fingers of course. I hadn’t heard of gazpachos… but will definitely give that a try when I get the opportunity. Thanks Ell for dropping by and commenting….more or less the same with me…but I never used to eat rabbit but now I do enjoy it with garlic. Interesting point Elle : Although I would eat Rabbit, I haven’t eaten Beef this Century (Grew up on a Cattle Farm, and wanted to show some solidarity…). This gets a few odd reactions in Spain. I have considered claiming to be a Hindu, but think that may just confuse things further. So you just add an ‘s’ to gazpacho and you get something completely different (and delicious looking). Actually everything here looks delicious. K is veggie and we used to have a pet rabbit so it’s off the menu for me – did you take that shot with the bird? Great capture!